Julien Wilson is the recipient of the 2015 APRA Art Music Award for Excellence in Jazz, a trifecta of Australian Jazz ‘Bell’ Awards in 2014, the 2008 ‘Bell’ Award for ‘Australian Jazz Artist of the Year’, the 2006 Music Council of Australia/Freedman Fellowship for Jazz, and the 1994 National Jazz Award. The funds from the Freedman Fellowship enabled him to record an album in New York with Jim Black and Mark Helias, and take his trio on a three week European tour that included two sold out performances at the Berlin Jazz Festival. Born in Melbourne in 1972 he attended primary school in Scotland, took up clarinet at 10, and then switched to tenor saxophone at 14. He was offered a piano tuning apprenticeship at 17, but chose instead to study improvisation at the Victorian College of the Arts with Brian Brown & Barry Duggan. In 2001 he received a Graduate Diploma from New England Conservatory in Boston where he studied under scholarship with Jerry Bergonzi and George Russell. Julien has released close to twenty albums as leader or co-leader and plays regularly with a wide range of groups. Over the last two decades he has toured extensively overseas, spent extended periods living in Zurich & New York, and made long-term contributions to high profile groups including The Australian Art Orchestra & The Black Arm Band. He has been an integral member of a number of critically acclaimed co-operative groups including SNAG, Assumptions & Ishish and is featured on award winning albums by Barney McAll, Stu Hunter, Jonathan Zwartz, Kristin Berardi, and Ben Salter. In late 2013 Julien released This Is Always at Wangaratta Jazz Festival. For his first recording with a ‘classic jazz quartet’ he assembled the dream-team of Allan Browne, Jonathan Zwartz and Barney McAll to create a timeless set of standards. The album received public and critical acclaim, and in May 2014 Julien became the first ever recipient of three concurrent Australian Jazz Awards related to this album. Best Australian Jazz Ensemble, Best Traditional Australian Jazz Album, and Best Australian Jazz Song of the Year. It was a finalist for Best Independent Jazz Album at the AIR Awards and was Birdland Records’ best-selling jazz release for 2014. The same quartet released a live album in 2015 entitled This Narrow Isthmus which was in Birdland’s top seller list for 2015 and 2016. 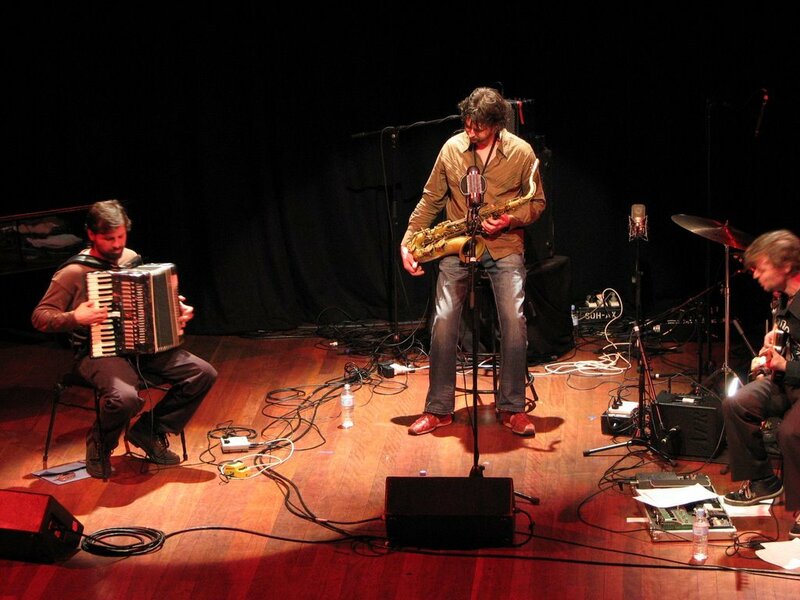 Julien’s long-standing trio with Steve Grant (accordion) and Stephen Magnusson (guitar) have been praised as one of the most original groups in Australian Jazz. The Trio were featured on while you were sleeping in 2006 and released Trio-Live in 2007, recorded at Bennetts Lane Jazz Club as part of ABC Jazztrack’s 30th Anniversary Concert. On their most recent album, Swailing, they utilised the recording studio and an expanded palette of instruments to take their music in new directions. Swailing was a finalist for the 2014 Music Victoria Genre Award for Best Jazz Album and was on Birdland’s best-seller list. Julien’s original music for quartet with guitar/bass/drums has been performed by many mutations over the years, including his Sydney quartet, The Coathangers. In 2011 The Julien Wilson Quartet was re-incarnated as “B for Chicken” with an all-new line-up. The powerhouse band features Craig Fermanis, Chris Hale and Hugh Harvey. They are currently rehearsing and developing new material in preparation for a recording. In addition to his own projects, Julien is, or has been, a member of groups including Transients, Sam Anning Quintet, Cool’sCool, Jex Saarelaht Quartet, Nashua Lee’s Rabid Hawk, Paul Grabowsky Quintet, Los Cabrones, The Bennetts Lane Big Band, Rumberos, The B#BigBand, Mike Nock Trio, Murphys Law & 12ToneDiamonds. He has been featured as a soloist with the Kurt Elling Quartet (USA) & The Sydney Symphony Orchestra, Gavin Bryars (UK) & Aventa Ensemble (Canada) and Paul Grabowsky’s Eye of the Storm Suite for Solo Soprano Sax with Jazz Trio + 30 piece Chamber Orchestra. He has recorded and performed with artists including Charlie Haden, Hermeto Pascoal, Paul Bley, Brian Wilson, Thirsty Merc, Hugh Masekala, Nigel Kennedy, David Ades, Bob Moses, Augie March, George Garzone, James Carter, Phil Treloar, David Tolley, Josh Roseman, Bernie McGann, Vince Jones, Paul Kelly, Archie Roach, Meshell Ndegeocello, Mavis Staples & The Artie Shaw Orchestra. Julien is currently an associate teacher at Melbourne University/Victorian College of the Arts and Monash University.